After a great mass extinction shook the world about 252 million years ago, animal life outside of the ocean began to take hold. The earliest mammals entered the scene, and reptiles — including early dinosaurs — lived on Pangea, the name given to the giant landmass in which all of the world's continents were joined as one. A project spanning countries, years and institutions has attempted to reconstruct what the southern end of this world looked like during this period, known as the Triassic (252 to 199 million years ago). Led by paleontologists and geologists at the University of Washington, the team has uncovered new fossils in Zambia and Tanzania, examined previously collected fossils and analyzed specimens in museums around the world in an attempt to understand life in the Triassic across different geographic areas. Findings from the past decade of fieldwork and analysis are reported in a publication of the Society of Vertebrate Paleontology, appearing online March 28. In total, 13 research papers detailing new fossils, geologic discoveries and ecological findings in the Triassic make up the society's 2018 special-edition volume, published once a year in a competitive submission process. "Most of what we know about the major mass extinction is from the South African Karoo Basin. I was always interested in understanding, do we see the exact same pattern around the world, or do we not?" said co-editor Christian Sidor, a UW biology professor and curator of vertebrate paleontology at the Burke Museum of Natural History and Culture. "The fossil record can be great to understand timing and sequence, but not always great at looking at things in a geographic context." Since 2007, Sidor and his team of students, postdoctoral researchers, paleontologists and geologists have visited the Ruhuhu Basin of Tanzania five times and the Luangwa and mid-Zambezi basins of Zambia four times. They lived there for about a month at a time, often hiking for miles to find fossil sites and camping in villages and national parks. Once, they were even awakened by the stomping and calls of elephants only feet from their camp. Each site in Tanzania and Zambia contains its own collection of fossils from the Triassic and other periods, but the goal of this decade-long project was to look across locations hundreds and thousands of miles apart to find similarities in the fossil records. Two papers describe the regional patterns and similarities across much of what used to be Pangea. "These papers highlight what a regional perspective we now have — we have the same fossils from Tanzania, Antarctica, Namibia and more," Sidor said. "We're getting a much better Southern Hemisphere perspective of what's going on in the Triassic." Most of the papers in the special edition discuss new fossil findings from the paleontological digs. 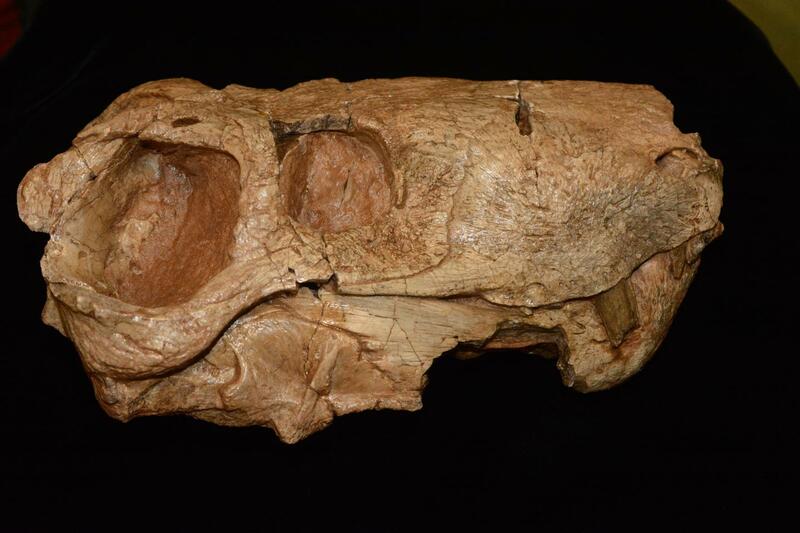 One explains the discovery of a new species of lizard-like reptile called a procolophonid. Another details Teleocrater, an early dinosaur relative that walked on four crocodile-like legs. This finding was reported in Nature last year, but the new paper describes the animal's anatomy in fuller detail. Most of the remaining papers describe other animals that were present in the Triassic besides the early dinosaurs. "This was a time when dinosaurs were just stepping onto the stage, and they were not very big and not very remarkable animals then," Sidor said. "These papers really round out what dinosaurs were competing with before they became the dominant reptiles on land." In addition to the 13 papers that make up the special edition, the team has published 24 peer-reviewed papers as part of this project in the past decade. More than 2,200 fossils were collected across Tanzania and Zambia over the last decade of fieldwork. Of the special edition's 27 authors, many participated in fieldwork with Sidor since 2007, including co-editor Sterling Nesbitt, a former postdoctoral researcher at the UW and now an assistant professor at Virginia Tech. Fossil hunting is an experience every member of Sidor's lab can have, from undergraduates through postdoctoral researchers. Sidor and a team are going again this August. "This has been what my lab has done, and all of my students have been involved in some way," he said. Four of Sidor's students and two postdoctoral researchers are co-authors of papers in the new special edition. Other co-authors are from The Field Museum; London's Natural History Museum; University of Birmingham; Virginia Tech; Royal Ontario Museum; California Academy of Sciences; Southern Methodist University; Petrified Forest National Park; Iziko: South African Museum; Muséum national d'Histoire naturelle (Paris); University of Chicago; University of the Witwatersrand; National Museum (Bloemfontein); Museo Argentino de Ciencias Naturales; Rowan University; and North Carolina Museum of Natural Sciences. Fieldwork in Tanzania and Zambia was supported by the National Science Foundation, the National Geographic Society, The Grainger Foundation and The Field Museum/IDP Foundation, Inc., African Partners Program. Additional support for analysis and museum research are noted in the individual papers.